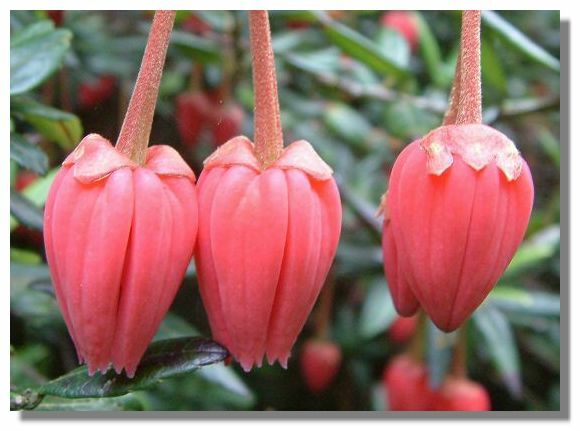 The Chilean Lantern Tree is an evergreen which produces long, stalked buds in the autumn/fall. But it is not until the following spring that they swell up and form these 3cm (1¼") long flowers, looking a bit like tulips hanging upside down. In a sheltered position (this one was in the heart of the Glendoick woodland area), it can survive temperatures down to -10C (14F). Go to the Next Illustration in the series. Or return to the Thumbnails Index.